Global news is generally bad news. On the surface, the story is about war, poverty, ethnic and sectarian strife. Democracy movements advanced by the U.S. government seem to be stalled or even reversed. Yet just below the surface, more hopeful trends are brewing. A new global awareness of the people at "the bottom of the pyramid" is summoning forth an unprecedented response to human need and suffering. It involves a shift from vertical to horizontal power that official aid agencies are only beginning to comprehend. Whereas twenty-five years ago, government aid accounted for 70 percent of all American outflows, today 85 percent of all outflows of resources come from private individuals, businesses, religious congregations, universities, and immigrant communities. If aid policy in the twentieth century relied on top-down bureaucracy dominated by policy specialists and elites, the twenty-first century is shaping up as an era in which citizens, social entrepreneurs, and volunteers link up to solve problems. U.S. military and economic power are basic components of America's presence in the world; but in an environment of rampant anti-Americanism, it is compassion that is America's most consequential export. 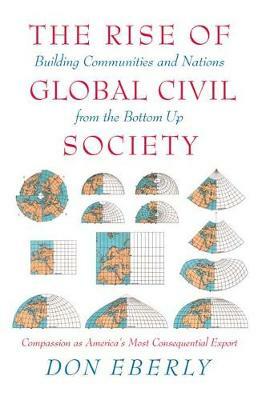 Civil society, once the distinctive characteristic of American democracy, is now advancing across the globe, carrying with it new forms of philanthropy, citizenship, and volunteerism. Tens of thousands of voluntary associations are prying open closed societies from within, solving problems in new ways, and forming the seedbed for a long-term cultivation of democratic norms. Building Nations from the Bottom Up: The Global Rise of Democratic Society presents a sweeping overview of the forces now shaping the global debate, including citizen-led development projects, poverty-reduction strategies that substitute opportunity for charity, and electronically linked movements to combat corruption and autocratic rule.